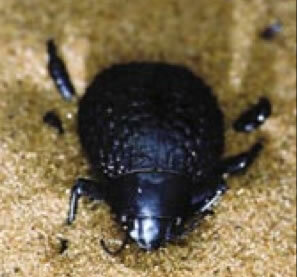 The Namib Desert beetle lives in one of the driest places on earth - just one half of an inch of rain per year. When early morning fog offers the hint of moisture, the beetle is ready to take a drink - from the amazing surface on its back. MIT researchers, inspired by the beetle, have created a material that can capture and control tiny amounts of water. When the slightest fog blows horizontally across the beetle's back, water droplets just 15-20 microns in diameter start to accumulate on the bumps on its back. The bumps are surrounded by waxy water-repelling channels. When a bump collects enough water to form a big droplet, it rolls down a channel right into the beetle's mouth. MIT researchers Robert Cohen and Michael Rubner were inspired by a 2001 article in the journal Nature describing the beetle, and thought it would be a good candidate for biomimicry - the imitation of a natural-world solution to a problem. Their newly designed material combines a superhydrophilic (water-attracting) surface with superhydrophobic (water-repelling) surface. A Teflon-like substance is applied to a surface (for water-repulsion); silica nanoparticles and charged polymers help create a rough texture to attract droplets. The research was funded by our good friends at DARPA. In the dew collectors of Herbert's imagination, a special material changes from light to dark in order to pull moisture out of the air. Cohen and Rubner's new material should be able to do the same trick using a different technology. If you are interested in these materials science stories, take a look at Water-Repellent 'Bumpy' Glass Mimics Lotus Leaves and Arachnid Adhesion: The Sticky Feet Of Spiders.Read more at Beetle spawns new material.